Offer layaway plans or payment plans to customers so they can select a payment schedule that works for their budget and timeline. 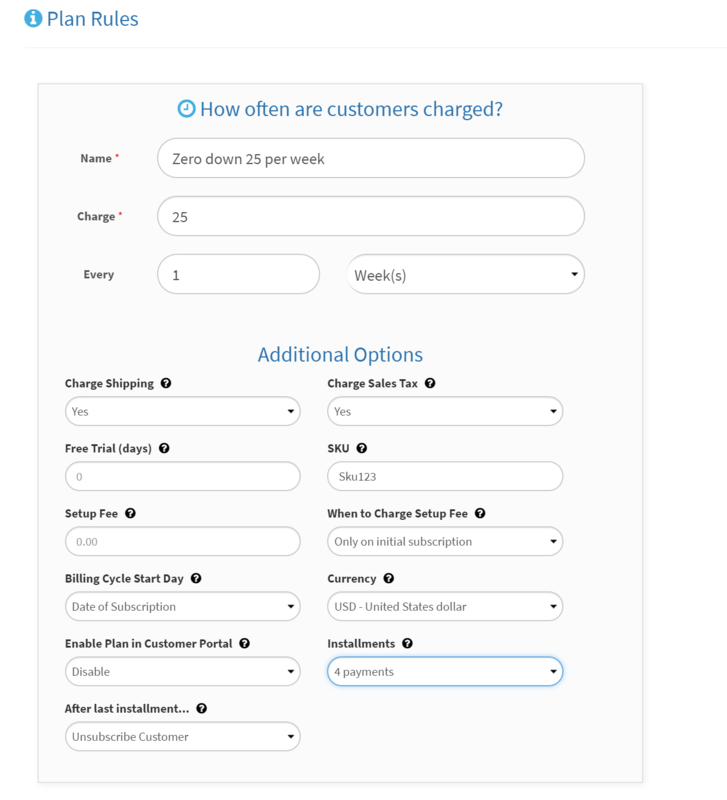 When you create a payment plan in PayWhirl you can specify the charge AMOUNT, the charge FREQUENCY, and the number of INSTALLMENTS (aka charges) the plan should process before an order is placed in a connected system. One popular use for PayWhirl is to setup "lay-a-way" payment plans for expensive products or services so your customers can purchase an item by making several payments over a specified period of time, until the item is paid for completely. For example, suppose you are selling a product for $100. 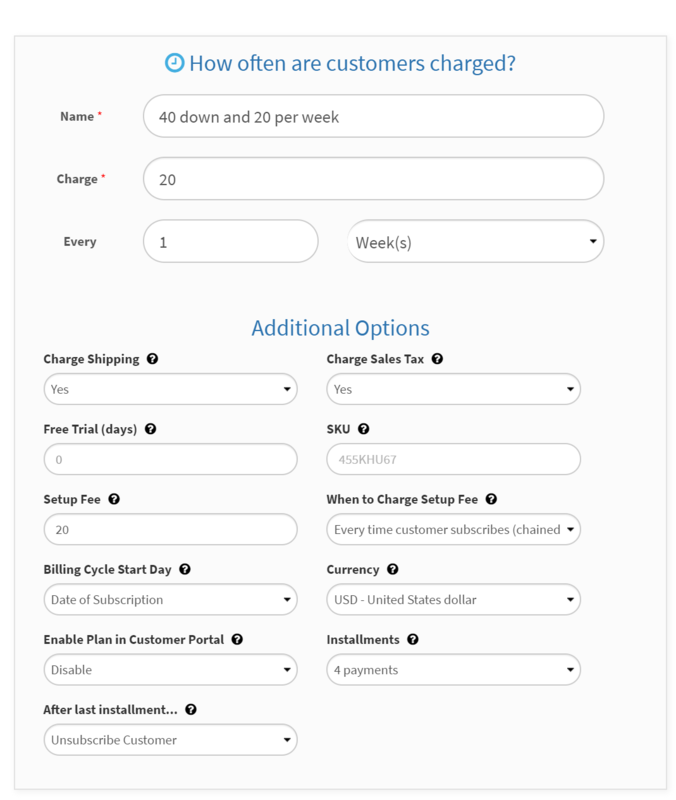 Instead of only giving your customers the option to pay in full, you can offer them options to break the order up into smaller payments by creating installment plans (aka layaway plans) for the product in PayWhirl. In the example below, customers will have TWO different layaway options for the $100 item, but you can create as many payment plans as you need. The first $100 layaway option is 4 weekly payments of $25 each. The second $100 layaway option is $40 down and 3 weekly payments of $20. 4 weekly payments, of $25 each, totaling $100. After you've configured the rest of the plan settings make sure to SAVE. If you are integrated with a shipping or fulfillment provider (Shopify, Shipstation, BigCommerce, etc) you can configure the order frequency settings for the plan after it's been saved. In both examples, our customers will not finish paying for the item until all the installments have been paid successfully, therefore, we will need to make sure orders are only placed after the LAST installment has been paid. Finally, save the plan and you will have created a layaway option for customers that will bill them $25, once a week, for 4 installment payments, then it will place an order after the last installment has been paid in full and cancel the subscription. $40 down payment and 3 weekly payments of $20, totaling $100. In the second $100 example, we're going to take a larger payment up front ($40) and then break the remaining balance ($60) into 3 payments of $20. We will use the "setup fee" in the plan settings to add the extra $20 to the customer's initial payment. After configuring the rest of your plan settings click SAVE to configure the fulfillment rules just like the first example. Once you have created your two "lay-a-way" example plans, the last step is to create a payment WIDGET so you can display the layaway options to your customers. I would recommend using the pricing table widget in this example because it only allows customers to select ONE of the plans listed inside. A multi-select widget works similarly but would allow customers to select both plans so it's not desirable in this situation. However, depending on your exact use case one type of widget may work better than the other. Learn more about the different types of widgets PayWhirl offers. Finally, once you have the widget configured, you can embed it directly into your website by copying one of the embed codes provided by PayWhirl and pasting it into the HTML of a page on your site. Many website builders like Shopify and BigCommerce have code toggle to switches (with a symbol that looks like this </>) in their wysiwyg page editors. 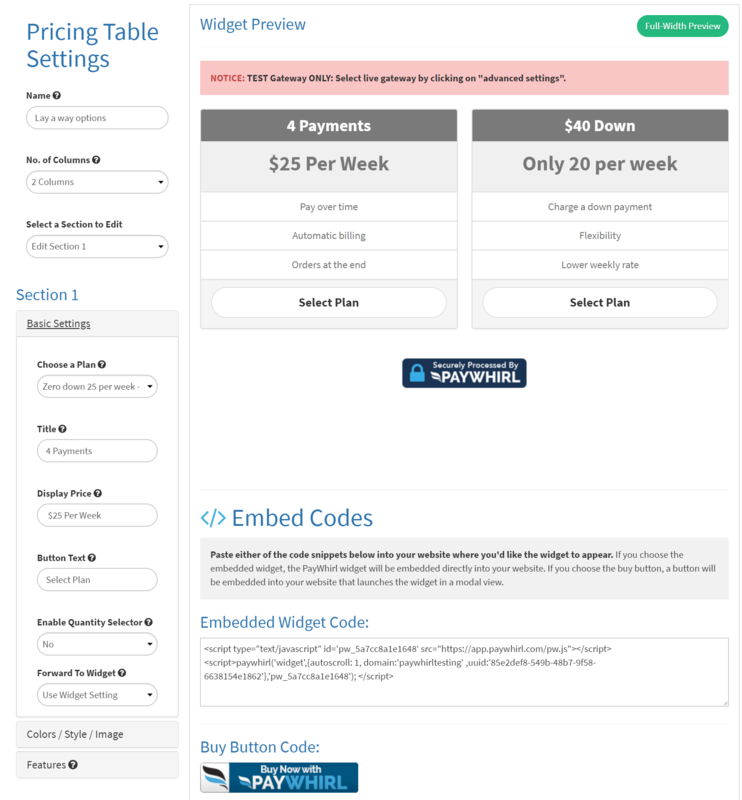 Others like Squarespace or Wix will have you add a "code block" in the settings to make payment widgets appear. If you have any questions about layaway payment plans, or plans with a specific number of installments, please let us know!